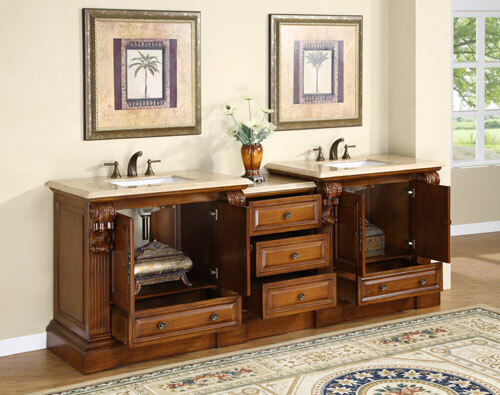 With its gorgeously intricate carvings along the fronts of the cabinets and its warm Cherry finish, the 95" Kalivas Double Sink Vanity makes a splendid centerpiece to any bathroom. 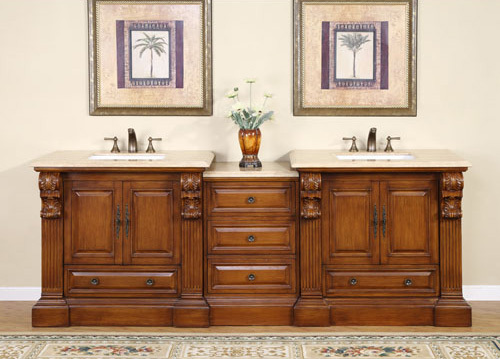 Featuring two double-door cabinets and two single drawers, there's plenty of room for all your bathroom necessities. A detachable drawer bank in between the two sinks provide an additional three drawers of storage, ensuring that you won't run out of space! The tops are made from Roman Vein-Cut Travertine and are matched with white ceramic undermount sinks. Faucets are not included.